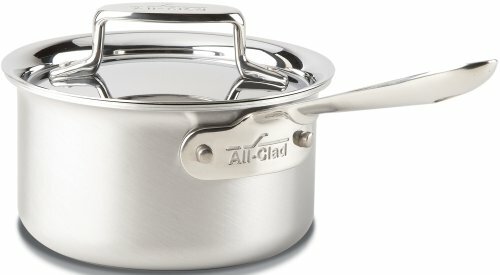 Because of its shape, this All-Clad D5 STAINLESS Brushed BD55201.5 1.5-Quart sauce pan is ideal for making sauces, heating liquids, cooking food in liquids and reheating. With high, straight sides and a smaller surface area, the sauce pan holds heat well and limits evaporation. The classic sauce pan is a versatile essential found in a variety of sizes in every well- equipped kitchen, and it can be used with or without its lid to control evaporation. The only cookware of its kind, All-Clad D5 STAINLESS features a patented technology of five alternating layers of responsive aluminum and durable heat-diffusing stainless steel. d5 STAINLESS cookware heats slowly and evenly, which means perfectly browned proteins throughout, from the center all the way to the edges. The 5-ply bonded cookware’s 18/10 stainless-steel interior with a highly polished starburst finish offers natural stick resistance, and prevents food from picking up a metallic taste, while its fingerprint-free brushed stainless exterior offers exceptional beauty. Made in the USA, All-Clad d5 STAINLESS cookware provides pouring lips, large handles with bolsters, dishwasher-safe convenience, and is optimized for induction. Experience a lifetime of cooking enjoyment with All-Clad D5 STAINLESS. If you have any questions about this product by All-Clad, contact us by completing and submitting the form below. If you are looking for a specif part number, please include it with your message.